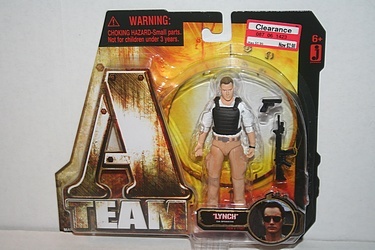 The A-Team movie from earlier this year was somewhat of a flash in the pan, in spite of their 'flying the tank' awesomeness, and so accordingly the toy line by Jazwares was pretty slim and brief. Interestingly, the figures are selling for a premium on eBay and aren't all that available, even though at least my local Target was blowing them out a few weeks ago. Due to my indecision on the line, I managed to miss the 3 3/4" Faceman, but do have the rest of the line, so today let's check out Colonel Lynch. Pretty much a no-brainer at $2.98, though the questionable 12" figures at 50% off were still a stretch...I just couldn't get past the matte colored molded clothes. Something about the technique that Hasbro has figured out to make the molded clothes on their recent 12" Joes definitely worked out better. Be sure to go watch some classic episodes for more crazy Lynch action. Update: Oops, looks like the image was still linking to Murdock - that's fixed now. See what I mean that the sets all look pretty similar? !